We’re easy to reach, right in the heart of downtown Santa Rosa. You’ll find driving directions,public transit information, and an interactive map all collected on our contact page. From the public garage between 7th and 10th Streets, you can walk into our courtyard through our clearly-marked back gate. As you enter, the first person you’re likely to see is one of our volunteer greeters. If it is your first time with us, he or she will direct you to the Visitor’s Table, where you may make a name tag, pick up brochures or a newsletter, and chat with one of our membership volunteers. You can also fill out a visitor card if you’d like us to send you the newsletter for a few months so you can learn more about what’s happening here. Of course, you are welcome to bypass the Visitor’s Table, or visit it after the service instead. At the Visitor’s Table a member will be available there before the service to greet your family, and can show you to the religious education wing where we care for infants, toddlers, and school-age children during the service. Please take a moment to fill out the short registration form for each child who will be attending, so the teacher can get their name right and will be made aware of any special needs you child has. Details about the curricula for each age group are available on our Children and Youth Religious Education Programs page. During the 9:15 service, all the children begin in the sanctuary where they hear the Story For All Ages and then depart with their teachers to the classrooms. You are always welcome to stay with your infant, toddler, child or teen in the RE wing — you are equally welcome to keep them with you in the sanctuary during worship. 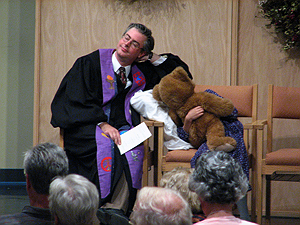 Occasionally parents opt to listen to the service broadcast from the art gallery/hallway adjacent to the sanctuary, where comfortable chairs and a selection of toys are readily available. The service begins right on time with a musical prelude by our pianist or another musician or the choir. Then a minister or worship associate (volunteer lay leader) welcomes all to the service and makes a few announcements about upcoming activities. 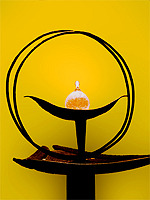 We light a candle in a metal sculpture called a “flaming chalice”, which is a symbol used by many Unitarian Universalist congregations/groups to begin services, or start meetings of study groups or committees. The flaming chalice has a special history and meaning within UU. In the words of the late UU minister Elizabeth Selle Jones, the flame “affirms the light of truth, the warmth of love, and the fire of commitment.” Then we often sing a song from our hymnal. These songs reflect a variety of musical styles and cultures. There is often a reading from poetry, philosophy, the Bible or other sacred scriptures of the world, sometimes read in unison, sometimes responsively, or sometimes simply read by a service leader. The minister then reads the joys, sorrows and notable events that people have written in our milestones book, which is kept in the lobby throughout the week and before the service. Words of spoken prayer or meditation follow and we take three minutes of silence for personal reflection in community. Afterward we sing a short meditative song called “Spirit of Life“. These uplifting lyrics are printed in the Order of Service, so don’t be surprised if you feel moved to sing along. After some special music or another shared song from the hymnal, we listen to the sermon. If you’d like to know in advance what the sermon topic will be, check the upcoming sermon topics page or the front page of each month’s newsletter. The selection of audio recordings and transcripts on our sermon sampler page can also give you an idea of the diversity of topics and perspectives we address. After the sermon, we give and receive an offering of financial support for the work of the congregation; or for a specific announced organization that serves needs in the local community or the wider concerns of state, nation, or world. As a visitor to our congregation, you are our guest; you are welcome to let the basket pass by. During the offering we listen to more music, usually a solo by our pianist. We sing a closing song from our hymnal then stand as the minister offers brief words of blessing and farewell. We end the service by extinguishing the flaming chalice. After the service, everyone is invited to stay for refreshments and conversation. 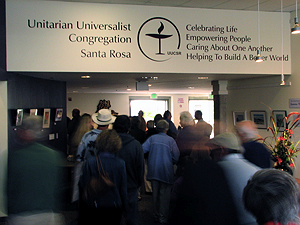 There are information tables, volunteer tables, a book cart to purchase CDs of sermons or books about Unitarian Universalist heritage and identity, social issues, and spiritual practices. Often there are also public forums or adult enrichment programs on various topics. Read a visitor’s blogging review of one of our worship services! Discover other local congregations, and learn more the faith we share.